On their eleventh patrol, Lt. Cdr. Eugene Fluckey and his submarine USS Barb sneak into Namkwan harbour in Occupied China. It’s insanity – the harbour is part of Japanese territory and the water is so shallow he has to attack on the surface. But it’s a success: USS Barb sinks at least one ship and returns home unscathed. At this point in the war, there aren’t that many ships left in the water anymore. So Fluckey is figuring out ways to take the battle to the Japanese. First by attacking Namkwan Harbour. Then by outfitting his submarine with rocket launchers. On his twelfth patrol, Fluckey is unleashed along the Japanese coastline. With orders from Commander of Submarines Pacific, Vice Admiral Lockwood, to “raise a rumpus.” Lockwood needs USS Barb to create a diversion and distract Japanese forces from another crucial mission happening elsewhere. 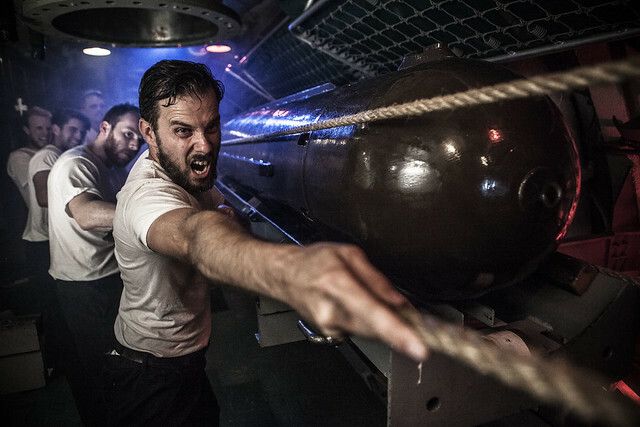 USS Barb is ready – armed for a harassment campaign like no other submarine before. They sink boats with their deck guns, then sneak into Shari harbour at 2 am to fire rockets at manufacturing plants. Valuable targets for the American war effort. The attacks are so successful that the Japanese think there’s a wolfpack in the area. But when USS Barb discovers a Japanese convoy, an epic battle begins between the submarine and Japan’s ultimate anti-submarine destroyer, Terutsuki. For USS Barb it’s a disaster. Not one of their torpedoes hits the destroyer. Terutsuki bombards USS Barb with depth charge after depth charge. Pinned below by both aerial and surface attacks, USS Barb barely makes it out alive. They beat a retreat using radical turning manoeuvres and decoys to escape. USS Barb continues the patrol, embarking on a campaign of harassment using the full arsenal of rockets, deck guns and torpedoes. Along with sinking a freighter, USS Barb destroys a communications station, an army barracks, and rockets the factory town of Shikuka.